Map from VIP Tickets and Corporate Hospitality. Leave M6 at J21A and join M62 west. Leave M62 at J6 to join M57, follow signs for the races. Leave M6 at J26 and join M58, follow signs for the races. Follow signs for Preston, then for A59, then signs for the races. 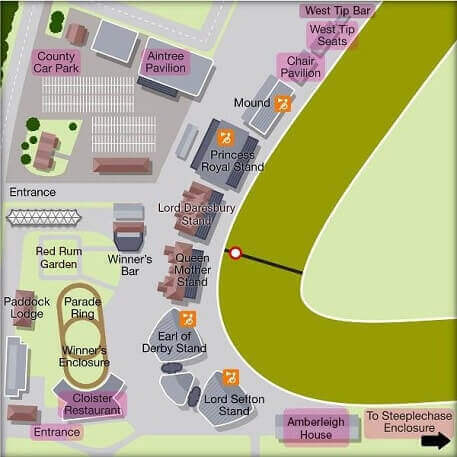 Limited on-course parking is available for the Grand National meeting. This can be booked by calling the booking line on 0844 579 3001. 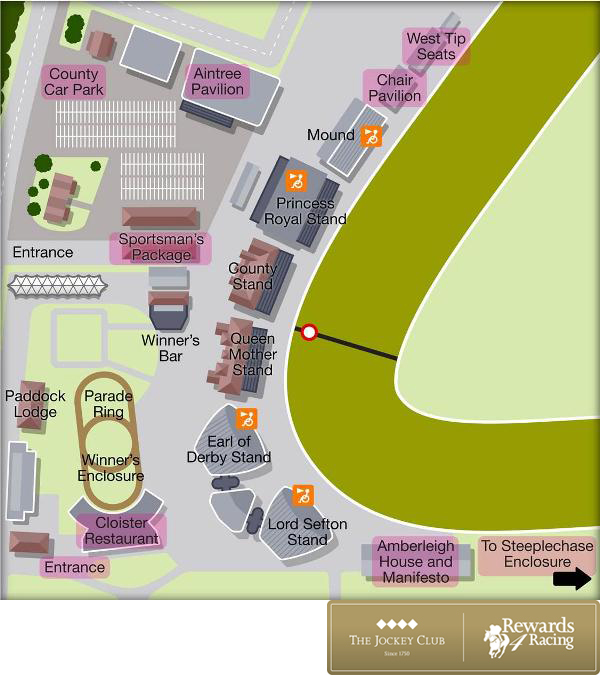 Other than Steeplechase and County Car Parking, there is no other car parking in and around Aintree Racecourse. Buses, taxis, private hire and trains all operate to Aintree and special arrangements will have been made for them. Take bus services: 300, 311, 345, 350 and 351 both to and from Liverpool. From Bootle New Strand take route 61A. For further information on bus routes, contact Traveline or visit Mersey Travel. The nearest mainline station to Aintree is Liverpool Lime Street. Liverpool Central Station is just a short walk from Lime Street, and from here you can catch a train to Aintree. Trains depart from Liverpool Central every 7 and a half minutes during the Grand National, and every fifteen minutes on race days outside of the Grand National. It takes fifteen minutes to get to Aintree on the train, and Aintree Station is directly opposite the racecourse. Liverpool John Lennon Airport is the nearest airport to the racecourse and is a 20-minute drive by road. Alternatively, take a bus to Liverpool South Parkway Merseyrail station where you can catch a train to Aintree (change at Liverpool Central or Moorfields onto the Ormskirk train). Manchester Airport is approximately a 45-minute drive by road. 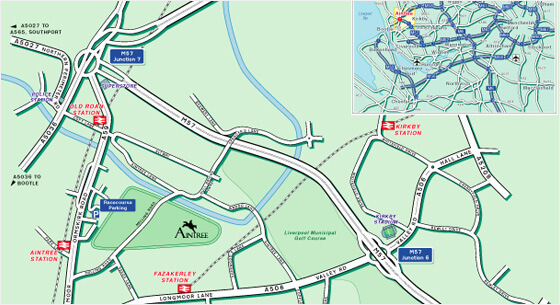 An Aintree Racecourse Map – including the golf course situated within the race track.